Hey Y'all, this isn't new news but I thought it might be of interest to a few of you Sega fans out there if (like me) this is the first you've heard of it. Seems a new guy has taken up the reins of original Xbox Emulation and has resurrected OG Xbox emulator Cxbx and re-branded it Cxbx-Reloaded. And with this, it appears that Sega Chihiro emulation is getting a step closer. YouTube user UK Arcades has uploaded a couple of videos that show him managing to navigate through the menus and (almost) get in-game on the beta arcade version of and . Another YouTube user called Luffy Tam has actually managed to get in-game with albeit with some pretty messed up graphics. So yeah, good to know that progress is still being made in this department. I thought any interest in trying to emulate Chihiro games had evaporated years ago. I never got play (or even see) Virtua Cop 3 in the arcade, so would be great to actually play it at home some day. It would be nice if it happened, but I've lost all hope of xbox hardware getting emulated. Let's give him a few more months and see if he decides to give up. Out of curiosity, will this give access to any game that has not been playable until now? ie, some of the Sega games have had really good ports to other systems, or some of them have already been emulated in different ways, so wondering which fully new games one could expect if this happens? Pull out your old tony hawk ride controllers so you can play ollie king. I'm guessing Outrun Online Arcade was pretty much a straight port of the Lindy version of Outrun 2 SP DX (which would tie in with the other Lindebergh games that did get PS3 conversion, like HOTD4 and After Burner Climax), which might explain why it looks so much nicer than the PC version of Coast 2 Coast and has got the missing end of course animations. I wonder if there's any extra stuff in the Lindbergh version of Outrun that wasn't in Online Arcade? And with TeknoParrot now starting to emulate Sega Lindbergh games it's a win win for all us arcade enthusiasts! Oooooh, timely. 'Runs naively on Windows with no virtulisation'. Exciting times! Color me impressed. That'd take a lot of work to pull off. good april fools day prank. although announcing it early is a good move. I was a teeny tad sceptical when I first heard that Lindbergh emulation was getting added to Teknoparrot however many weeks or months ago it was first announced. In reality though, Reaver's got nothing to gain by lying about it and the YouTube footage of the actual arcade version of AB Climax running looks genuine. Plus, all the other stuff he's said would appear in future versions of Teknoparrot (like FFB, link up, Sega Europa R games, TTX2 games) has happened, so I'm confident this isn't some kind of a wind up. The fact that the game hasn't been ported to more platforms is criminal imho. Sega could do like they did with house of the dead overkill and just have a small team port it. Yeah, totally with you on that Howard. I don't know if After Burner Climax fell afoul of licensing issues in the same way that Outrun 2 did, hence the lack of further ports. I remember at the start of sonic and all Star Transformed there was a licensing disclaimer about the use of the Grumman F14 Tomcat. Or it could just be Sega being a bunch of useless ---Deutsche Frankfurters--- as per normal. The latter is probably more plausible. Nope, 'fraid not. They were specifically created by Sumo digital for the Xbox port. You need to clear all Stage 4 missions in the challenge bit to unlock Bonus Stage 1 (Scud Race tracks) and all stage 6 missions to unlock Bonus Stage 2 (Daytona USA 2 tracks). You can also cheat and add the password TIMELESS (in capitals) on the gallery password screen. If you complete the challenges the bonus stages will stay unlocked, but if you use the password cheat, you'll need to enter it every time you turn the system on. If you've got the Japanese version, there's no password option so you have to complete the challenges, but on the flipside the Japanese version has got superior bonus stages to the Western version of OR2 as they are cosmetically closer looking to the actual Scud Race and Daytona 2 stages. Nice one, with that info I found some details of other unlockables. Putting it here for future reference as I'll come back. Thank you m8. Amazing stuff. Outrun 2 SP Lindbergh working on Windows. I bet Isamu will be happy about that. just wondering: In a linked outrun 2 sp cab, is the cooperative "driver change" the only 2 player option (like visible in the youtube movie)? Or can you also drive head to head in the same course like most arcade racers? I've never actually played the arcade version of Outrun 2 SP (only regular Outrun 2), but I'm sure that there must be a normal head-to-head 2 player mode. There's some text about it at 2:36. The driver change gimmick was just a mode that apparently didn't go over too well. It's totally optional. If the emulation is good and force feedback is enabled that'll probably mean the end of fxt..... I only started the project because emulating the arcade seemed far off. He said FFB is about 90% correct in the stream. He's uploading it now for people who want to go nuts. The first release is supposed to support OR2 and after burner climax. I didn't play the arcade version of OR2, but is there much difference between the original arcade and the many ports that the game had in PC, PS3/Xbox 360 online, PS2, XBox? And if so, which version could be the closer to the arcade? According to the forum that-must-not-be-named it looks like Lindbergh in Teknoparrot will be Win 10 only at present. Booooooo! It's probably dependent upon a certain version of direct x. I'm not sure why that would be necessary to emulate a 20 year old game, but I'm sure there is a reason. Honestly unless you are using a really old pc I don't know why you wouldn't be on win 10 at this point.... I mean it was a free upgrade for a whole year. 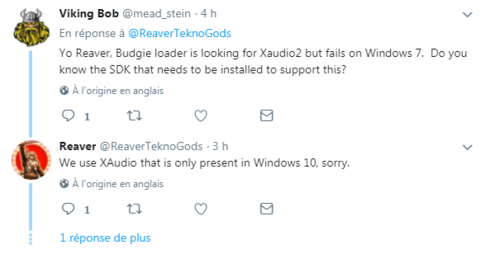 That seems like an odd decision, but then again I've never really used Xaudio for anything substantial, so maybe there is a reason I'm not aware of. Some windows-based arcade games support you typing the res you want into a config file. SR3, for example. If a patcher is needed, it might depend on the community. I'm ideally looking for an 800x600 mode myself, assuming the game isn't slaved to v-sync. What else apart from WMMT5 has a patcher, btw? Reaver is working on an OR2 res patcher today. He said he will put it on github. I haven't been able to get the game to work though. Has anyone had luck / have advice? Nvidia GTX 1050, i5-7500, & Win10 x64. big thanks to Boomslang. Updating my nvidia drivers from 388.13 (oct 2017) to 391.35 (mar 28, 2018) + a computer restart made or2 pop up! So is it out yet for non patreon people? I honestly don't have time to play it, but I can at least install it and give it a try. I'm super excited for this. Page created in 0.285 seconds with 62 queries.